creation | Move Your "..BUT God .."
I walked into the customer service waiting area at the car dealer’s, waiting for an oil change for my car. Ah, American that I am, with people in nearly every chair in the waiting area, where was I to sit? Sitting down next to a complete stranger seems like an invasion of their privacy. I looked around, then did the un-American-cultural act and sat down next to woman who was watching the television screen on the wall to our right. She smiled and readily agreed, and that began a forty minute conversation that turned deeper than either of us expected, I’m sure, when we drove to the dealership that morning. She’d grown up in Phoenix; me,too. Shirley is part Native American and part Hispanic, married to a man from Kokomo, Indiana. Hmmm….. “We were just in Kokomo two months ago for a wedding,” I commented. More commonalities emerged, including butterflies and beauty in nature that points to an intelligent, loving Creator God, and before we knew it, we were talking about deep things of our faith in Jesus. I held her hand and prayed for one of her family members, and she received the prayer gladly. I’m always floored by God showing up through the “cracked pot” and ”empty hose” that I am, and I always know it’s ONLY God who’s doing the connecting and work. Often I marvel and wonder that a Holy, Righteous, Almighty God somehow chooses and desires to move through the mass of organic matter that is me. It MUST ONLY be because I/you/we invite and welcome and, many of us, desperately long for, God’s very own Holy Spirit to come indwell me/you/us. I generally don’t “wax religious,” because repetitious religious ritual means next to nothing. My faith is relationship with my Creator andSavior. Still today I proclaim”Solo Deo Gloria”, to God alone be the Glory! he shields all who take refuge in him.31 For who is God besides the Lord? In the often barren, rocky places I’ve walked in the past eight years (including the times I’ve wandered off the easier path He had for me), God has continually come alongside me to refresh me with His Presence, His “winks,” and I am grateful every time! Shirley at the oil change was another “kiss on my cheek” from our faithful, ever-present Lord, King, Friend, Savior, and Guide. Whew, am I glad for this promise! I do NOT have the power to mess up God’s plans for my life! I may – make that certainly – have delayed them, or taken a harder road than I needed to, to come into God’s plans for me, but no, neither you nor I have wandered so far from God’s path and purposes, power and loving care that He can’t come beside you, rope Himself to you, and lead you even up on the steep, high places safely. Sing joyfully to the Lord, you righteous; it is fitting for the upright to praise him. the word of the Lord is right and true; he is faithful in all he does. 5 The Lord loves righteousness and justice; the earth is full of his unfailing love. 6 By the word of the Lord the heavens were made, their starry host by the breath of his mouth. 7 He gathers the waters of the sea into jars; he puts the deep into storehouses. 8 Let all the earth fear the Lord; let all the people of the world revere him. 9 For he spoke, and it came to be; he commanded, and it stood firm. 10 The Lord foils the plans of the nations; he thwarts the purposes of the peoples. 11 But the plans of the Lord stand firm forever, the purposes of his heart through all generations. No king is saved by the size of his army; no warrior escapes by his great strength. 17 A horse is a vain hope for deliverance; despite all its great strength it cannot save. 19 to deliver them from death and keep them alive in famine. 20 We wait in hope for the Lord; he is our help and our shield. 21 In him our hearts rejoice, for we trust in his holy name. 22 May your unfailing love be with us, Lord, even as we put our hope in you. Surely, Shirley was God’s reminder to me of His ever-present, ever-powerful love. Eight years ago I began a long journey with this song, believing then for a quick, victorious end that I have yet to see, and here I am again, leaning into the ONE who’s roped me in with HIM as I climb to higher places than I can see, even now. Four years ago I first posted this, and on this Palm Sunday I feel the need to repost what I wrote then. This first came to me in the teachers’ workroom at school, then exploded in me again the following Sunday, when the enormity of what God did for us in the atoning sacrifice of Jesus rose like a fountain of passionate love in my heart. It’s still true, and though my heart fell to fear of man and grief of loss a month after I first embraced this enormous truth, the GOD of grace, mercy, compassion, and love has walked with me steadfastly even as I slipped along the journey that led me here and, in some ways continues through a dark valley toward God’s goodness. I know a fraction of the price GOD paid for me, and in truth he never needed to send me any greater other proof of his love, for nothing more could possibly measure up to this undying incomprehensible gift. Yet out of love, he shows me his love so tenderly and powerfully. I pray it speaks to your heart today. How I treasure those brief flashes of deep, gut insight that hit me much less frequently than I long for. Do you know what I mean: times when you feel for a Nano-second that you’ve touched a deep truth about God, and you wish with everything in you that it would engulf you so you could immerse yourself in its power? Frustratingly, those moments never linger long enough. To give you a better sense of that immensity, if VY Canis Majoris was at the center of our solar system, its surface would extend at least beyond the orbit of Jupiter, and perhaps as far as the orbit of Saturn. What grabbed my attention in the video was the comment that if you could fly in a jet at 900 miles per hour, it would take you over 1,000 years to fly around the star! It’s so distant that the light of VY Canis Majoris takes 3,9000 years to reach us. I sat in bed at 5 a.m. that Sunday and tried to cold-start praise to the King of Kings as Holy Week began. A realization rose slightly above the horizon of my consciousness: WHOSE blood bought me? WHOSE blood? Yes, Jesus’ blood – that rolls of my tongue almost tritely sometimes – but WHAT blood is his? WHOSE BLOOD? And HE, THE GOD OF CREATION, PURE RIGHTEOUSNESS, PURE HOLINESS, PURE MAJESTY, PURE LOVE willingly gave it for me. I – like every oneof us – was bound for Hell until I saw and reached out for God’s merciful gift of love, Jesus. Oh, I wanted to grasp the enormity of that love in every cell of my body and neuron of my understanding! Like a meteorite, infinite love tore through the atmosphere of my finite comprehension. Why in the world do I think I’m not loved? Why do we think we have to, or ever could, earn that love? And engulfed by that love, why in the universe am I ever afraid? Even now I feel like I’m writing an ionic plasma breath of truth with hands and understanding of concrete, but O God, let me burn with that reality one day! Brand my heart with it now: I AM YOURS! YOU SOUGHT AND BOUGHT ME WITH THE COSTLIEST TREASURE IN ALL TIME AND UNIVERSE, YOUR OWN SON JESUS! So began an irreverent song in the 60’s, but as I walked back down the hill toward my house in the foothills today, a thought I’d had earlier in the week driving home struck me again. What are the conversations going on in the minds of the people in these custom and semi-custom houses? In reality, all they are is boxes. Unvoiced perhaps, but perhaps subconsciously thought, going up from these boxes: “ My box is bigger than your box… My box sits higher up the hill than your box…. I’m glad my box isn’t down there below the river …My box is full of more stuff, fancier stuff than your box… My box makes me important… My box tells the world who I am and why I’m important…” and perhaps some voices down below the river: “I wish I had a bigger box up on the hillside … I deserve a better box than this … .” Surely, and true, many people may be grateful for the boxes they have, that they have a box lid over their heads, that they have a place to sit and eat and sleep. Yet up here on the hillside (and even down below the river) nobody asks who the real lien holder on the land is, who holds your hill in his hands, who created the minerals in that mine far in the background, who can call in the loan at any time. A Psalm of David. The earth is the LORD’S, and the fulness thereof; the world, and they that dwell therein. For every beast of the forest is mine, and the cattle upon a thousand hills. I know all the fowls of the mountains: and the wild beasts of the field are mine. Job 41:11 Who has first given to Me, that I should repay him? Whatever is under the whole heavens is Mine. “You alone are the LORD. You have made the heavens, The heaven of heavens with all their host, The earth and all that is on it, The seas and all that is in them. You give life to all of them And the heavenly host bows down before You. Through Him all things were made, and without Him nothing was made that has been made. Walking down this hill that my mind and hand could never make, that no land developer or geologist or architect or construction engineer could ever create from pre-existing molecules,let alone from nothing. I bow in holy awe of the One who spoke, “Let there be earth,” shaped these hills, spun the earth to create day and night, gave me cells and DNA and breath and life, because without His Spirit and breath, I’m the same as the sand beneath my shoes. “Everlasting, Your light will shine when all else fades! Never-ending, Your glory goes beyond all things! And the cry of my heart is to give you praise – from the inside out, Lord, my soul cries out to you… consume me from the inside out.” Be all you are in me,and how totally implausible is that for me to ask of God Almighty? I have no right to ask that, EXCEPT that through Jesus I am adopted into God’s family,called his own, filled with his Spirit, loved, no matter what size or shape box i live in, how it is filled, how empty it may be, or who shares it with me. To one he gave five talents,to another two, to another one, to each according to his ability. Then he went away. He who had received the five talents went at once and traded with them, and he made five talents more. So also he who had the two talents made two talents more. But he who had received the one talent went and dug in the ground and hid his master’s money. Now after a long time the master of those servants came and settled accounts with them. And he who had received the five talents came forward, bringing five talents more, saying, ‘Master, you delivered to me five talents; here I have made five talents more.’ His master said to him, ‘Well done, good and faithful servant. You have been faithful over a little; I will set you over much. Enter into the joy of your master.’ And he also who had the two talents came forward, saying, ‘Master, you delivered to me two talents; here I have made two talents more.’ His master said to him, ‘Well done, good and faithful servant. You have been faithful over a little; I will set you over much. Enter into the joy of your master.’ He also who had received the one talent came forward, saying, ‘Master, I knew you to be a hard man, reaping where you did not sow, and gathering where you scattered no seed, so I was afraid, and I went and hid your talent in the ground. Here you have what is yours.’ But his master answered him, ‘You wicked and slothful servant! You knew that I reap where I have not sown and gather where I scattered no seed? Then you ought to have invested my money with the bankers, and at my coming I should have received what was my own with interest. So take the talent from him and give it to him who has the ten talents. For to everyone who has will more be given, and he will have an abundance. But from the one who has not, even what he has will be taken away. I hope, I pray, I have answers for those questions that will gladden the heart of God. Lord God, I am eternally grateful for a roof over my head, a place to sleep, food to eat,clothing to wear, family and friends to love, and, improbably, for my very life, a gift from you. Help me to manage all that you give me with love and faithfulness, out of love for who you are and all you’ve already given: the priceless blood of your son Jesus as a ransom for my life and soul, my righteousness, my life forever with you in your house. Coming home into my box, I fall on my face on the floor in reverent awe of the Holy One who created, differentiated, gave life to, and sustains it all and us all. A”…BUT…” to pray: God Almighty, I may not have much in the sense of possessions, or I may have more than enough, BUT no matter what I have or lack, I have YOU as my Creator, Sustainer, Provider, Provision, Father, Savior, Loving Lord,and that give me value no one can take from me. You say I am yours, and that alone makes me ___________________________________________________________________ and I thank you for your Spirit within me! Holy Spirit, I’m listening, and who can stop the Lord Almighty? I go deep, but I do come up for air sometimes and frankly relish the times I can feel relaxed. Even more, I enjoy the times God surprises me. I’m not an serious bike rider; my riding consisted of going up to the grocery store, riding my son down to his preschool and then myself over to substitute teach at a local school, or just riding around the neighborhood for fun. I do enjoy riding, but a nice flat bike path is my preferred route. Recently, though, I’ve been challenged to “kick it up a notch’ and try real road biking, complete with loooooong hills. Just getting adjusted to a much lighter bike, eleven gears I have no idea how to use, and a man’s frame was challenge enough for me, much less 3%-6% hills! I tried wearing bike shoes with cleats until the painful day early in my trial period when the sole pulled off my shoe as I tried to extract my foot from the pedal to stop. The hole in my tights slightly limited the hole in my knee…. Recently I tackled another ride with my good friend and the bicycle club he rides with. Ever the encourager, he has actually pushed me up a few hills with his hand on my back when I felt my heart rate hitting “let’s just pull over and breathe.” He knows I can do it! But on Wednesday my body decided to speak into his optimism, and after the first loooooong hill I called over to him, “I’m taking a right here, I know how to get back to the starting point!” Before he could object – er, encourage me – strenuously, I took a right and rejoiced at the much flatter road stretching ahead. After a quarter of a mile or so my heart rate fell back into the “No, you’re not having a heart attack” range, and even though the pavement was rough and I did feel a pang of “Quitter!” rising up in me, I was glad for the chance to breathe normally. But oh, in one mile I knew why I chose that point to bail out of the hill conquering. It’s been a looooooong time, over five years, since anyone gave me flowers. God gave me tremendous loyalty and the spirit to pray without ceasing for His victory in a tragedy, but sometimes God’s answer is “Not in the way you hoped for.” In all honesty, coming to terms with that answer has weighed on my heart on some of my rides, and carrying the weight of sorrow as well as my own body uphill on a bicycle is a load heavier than I can bear some days. I need to be honest with you all: yes, some days my faith, like King David’s in so many Psalms, cries out to God not understanding His why. I think that was part of my bailing out on this ride. 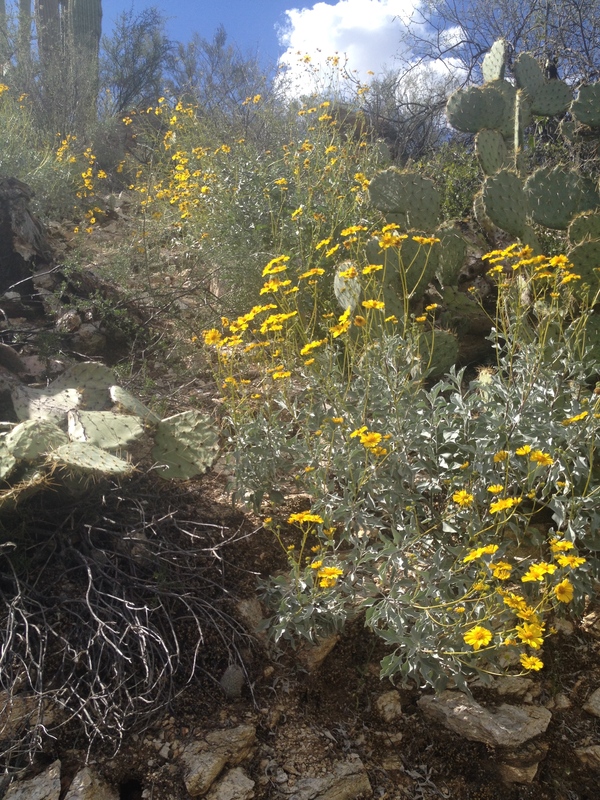 Imagine the sweet joy, then, of the wildflowers I saw lining the road for half a mile: yellow brittlebush, burgundy Perry penstemon, blue columbine, deep pink Baja fairy duster, orang globe mallow…. I stopped pedaling, propped my bicycle against the rock wall, and stooped to smell the flowers. My Father makes flowers! All the florists in the world can’t spread out a carpet like God does. Sometimes I’ve marveled at the odd truth that we humans have a sense of beauty. We may not all agree on what makes personal beauty, or even beauty in art, but every person launched into life appreciates the splendor of stars and loveliness of flowers. And why, I wondered, did God bother to make them so lovely? So different? Some so fragrant? Yes, I know they attract bees and moths and other pollinators, but why so colorful? Did He create them with more than pollination in mind? Why do we women view a gift of a bouquet, or even one single rose, as a gesture of love if God didn’t put HIS love for us into their beauty? My FATHER, your FATHER, extends the single stem of the Blood-red Rose of Sharon in love to you today.